Instagram is one of the most popular social networks that allow users to share their images and videos. Importing from Instagram to WordPress is a great way to grow your business by improving on social networking efforts. With over 400 million active users, Instagram is one of the most widely used social media networks. It enables users to share their Instagram photos with followers on other social media networks including Facebook, Twitter, Flickr, and Tumblr. In this article, I’ll show you how you can start importing from Instagram to WordPress with the WP RSS Aggregator plugin to share your photos and videos with your site’s viewership. Granted Instagram and WordPress do not have much in common – Instagram is a social media network and WordPress is a content management system. Why would you want to import from Instagram to WordPress in the first place? Let’s consider some of the different personas who would benefit from the Instagram-WordPress integration. Photographers. Photographers with WordPress-based online businesses can share all of their Instagram photos and albums on their WordPress site to gain recognition and, hopefully, get a few more clients on board. Assuming you have a pretty good follower base, importing from Instagram to WordPress will have a positive and lasting effect on your portfolio. Personal bloggers. If you’re running a personal blog then sharing images of your daily routine and activities forms an integral part of your site’s content. Being able to directly import images from your Instagram to your WordPress site will save you a ton of time. Travel bloggers. Those of you who are travel enthusiasts and are always on the go can share adventurous stories on their travel blog with a captivating image to go with it. What better way to share that image then importing it straight from your Instagram? Whether you want to grow your online business, increase incoming traffic, or simply keep a safe backup of your Instagram photos, you’ll need a powerful plugin to get the job done. 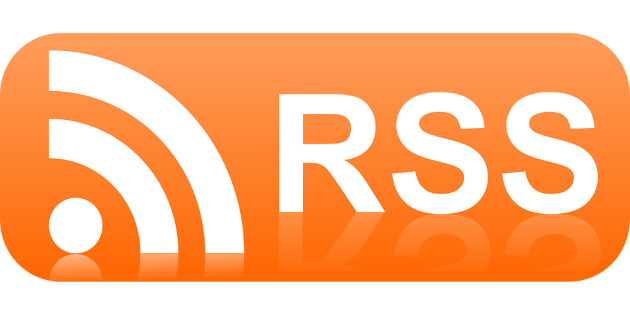 WP RSS Aggregator is the most comprehensive RSS feed importer and auto-blogging plugin solution for WordPress. It is an incredibly lightweight plugin that ships with the basic functionality in place to help you start importing, merging, and displaying both RSS and Atom feeds on your WordPress site. WP RSS Aggregator makes it easy for users to aggregate as many RSS feeds as they’d like from as many sources as they’d like. With its built-in shortcode integration, webmasters can display the RSS feeds directly onto their WordPress site. The plugin comes with a plethora of premium add-ons which users can utilize to leverage the full potential of this robust plugin. Figuring out how to manage and maximize your Instagram content on your WordPress site can be a daunting task – especially if you’re not particularly technically savvy. One of the best (and easiest) ways to do this is through RSS feeds which allow users to elegantly broaden the Instagram media files’ reach by presenting them on their site. The WP RSS Aggregator plugin works as a simple yet powerful plugin that effortlessly imports images from Instagram and displays them neatly on the user’s website. Once a user imports images, the plugin automatically embeds them in the site’s content which ensures that they look visually appealing and the theme’s layout remains intact. Although the WP RSS Aggregator plugin can handle displaying the imported images onto your WordPress site, users can further fine-tune how the images are displayed by installing the Simple Instagram Embed plugin to leverage advanced customization options. WP RSS Aggregator enables users to pull their Instagram photos directly from the social media site and display them neatly on their WordPress blog. In this section, we’ll walk you through a tutorial to help you get started with generating an RSS feed from an Instagram profile. 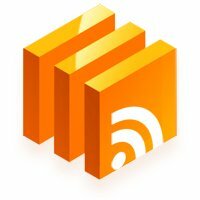 WP RSS Aggregator is available free for download at WordPress.org. To get started, you can either download the plugin from the WordPress plugin repository or search for WP RSS Aggregator from your site’s back end by navigating to Plugins > Add New. Once you’ve installed and activated the plugin, you’ll notice that a new menu item, RSS Aggregator, has been added to your WordPress menu sidebar. 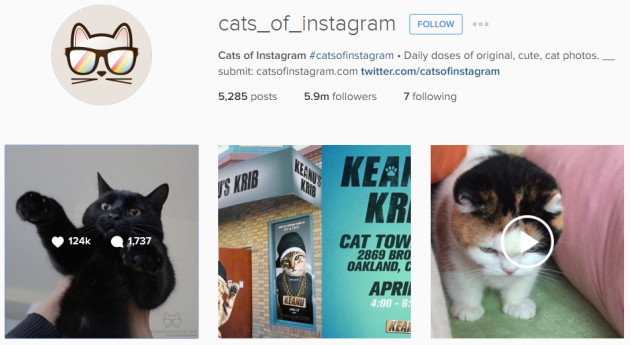 The first thing we’re going to do is create an RSS feed from an Instagram profile. Since Instagram doesn’t support RSS feeds by default, we’ll have to get a little creative. I’ve used cats_of_instagram to demonstrate this tutorial. Copy-paste the URL into a notepad file; we’ll use it again in the next section. Now that you’ve successfully created an Instagram feed, you can move on to adding a new feed source to pull your media items from. Navigate to RSS Aggregator > Feed Sources. URL. The URL of the feed source. Limit. The maximum number of imported items from this feed to keep stored. Link to enclosure. 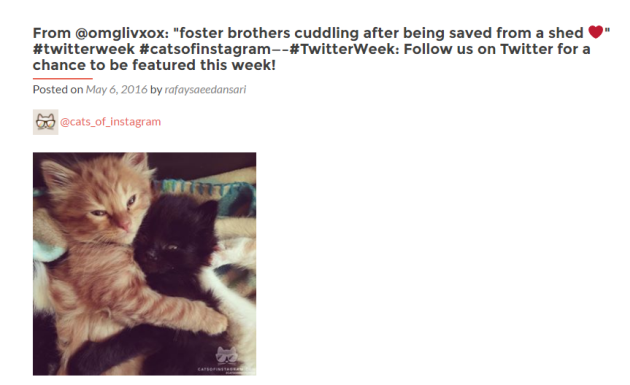 To make feed items link to the URL in the enclosure tag rather than the original article. Unique titles only. To allow multiple feed items to have the same title or not. Give your feed a name. Paste the URL you saved in the notepad file into the URL box. Click the Validate feed link below the text box to validate the URL. Click the Publish Feed button to publish your new feed. If you navigate back to the Feed Sources page, you’ll see that the Instagram feed has been added to your list of feeds. It also displays the status of the feed, details on the updates, and how many items were imported. To pause the feed, you can simply click on the pause button under the status column. All that’s left to do now is displaying the new, imported feed source onto our WordPress site. Navigate to the page or post where you’d like to display the feed. You’ll notice that a WP RSS Aggregator shortcode button has been added to the post editor. By clicking on the WP RSS Aggregator shortcode button, you can select which RSS feeds to display on the page or post. The window also has options to let you select multiple RSS feeds in one go or display all of them and choose the ones you’d like to exclude. Click the Add shortcode button. The shortcode will automatically be added to your page or post. 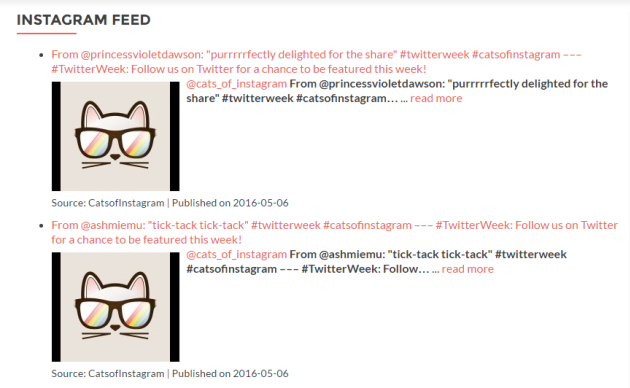 Click the Publish button to publish your Instagram RSS feed to your WordPress site. The shortcode pulled the RSS feeds we set up in the previous section and displayed them on the WordPress site. You can further customize the display settings by navigating to the General display settings section in RSS Aggregator > Settings. That’s all there is to it! 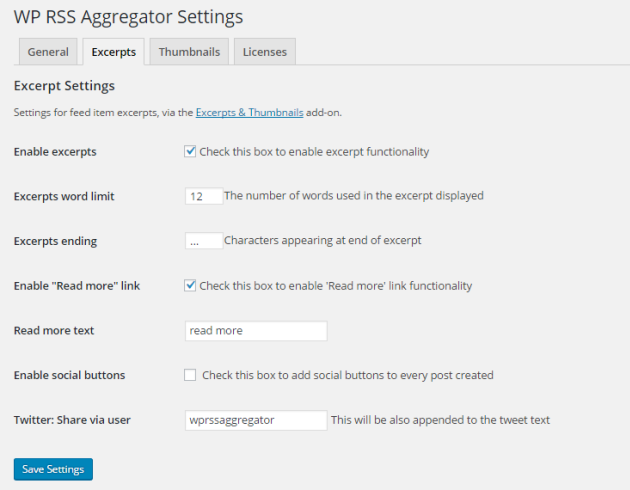 You’ve successfully imported from Instagram to WordPress by using the WP RSS Aggregator plugin without a hitch. With the free version of the WP RSS Aggregator plugin, you’ll be able to display RSS feeds just like this. When you’re ready to take things further, the plugin comes with a wide-range of premium add-ons that give users finer control over how the final output will be displayed. 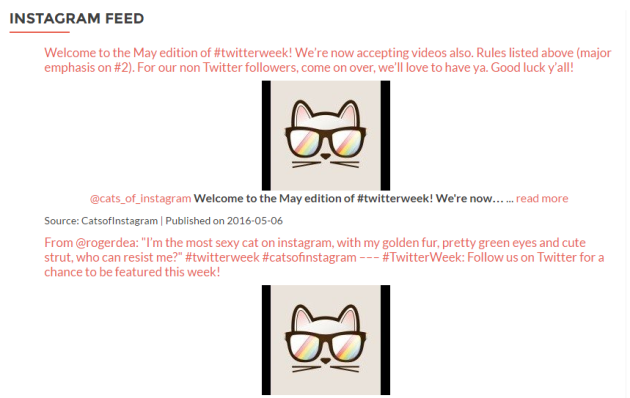 Let’s take a look at two of these premium add-ons – Excerpts and Thumbnails and Feed to Post. After installing and activating the Excerpts and Thumbnails add-on, navigate to the Settings (RSS Aggregator > Settings) page and enable the excerpts and the thumbnails functionalities from their respective tabs, choosing the settings you’d like. The RSS feed posts should now look something like this. 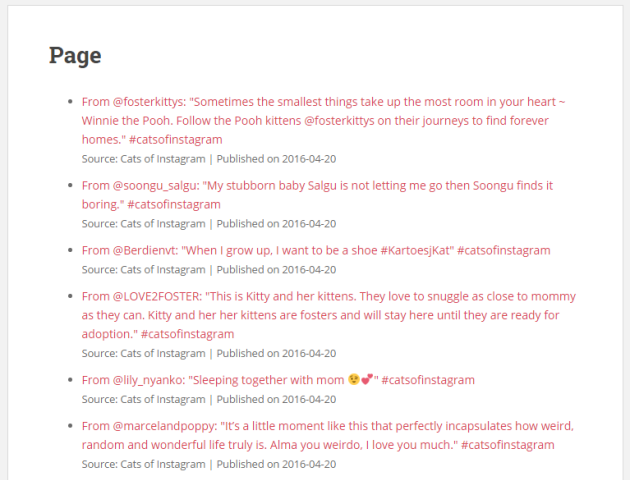 Feed to Post is an incredibly powerful add-on that lets you import feeds to different post types. For instance, you can have all of the imported feeds import to the Post Type: Post. With these settings applied, all of the imported Instagram feeds will automatically be imported as posts and saved as drafts. Similarly, if you choose to import the Instagram imported posts directly to your media library, you’ll see that your WordPress site’s media library contains all of the images. Instagram is an amazing social networking platform that can be used with your WordPress site to grow your business. 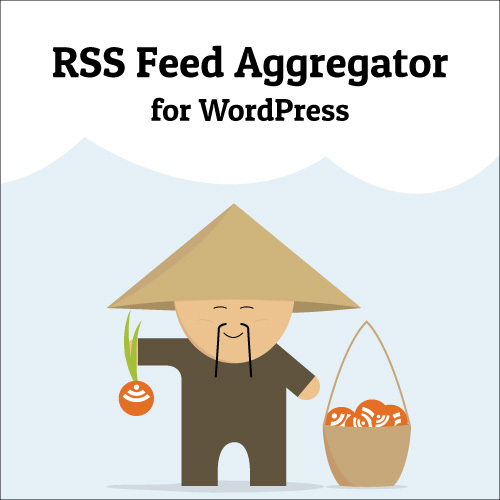 WP RSS Aggregator makes the Instagram-WordPress feeds integration easy to implement for all kinds of users. We looked at some of the ways you can use Instagram with your WordPress site by analyzing user personas and walked you through an in-depth tutorial to help you get started with importing from Instagram to WordPress using and incredibly powerful plugin – WP RSS Aggregator. We covered the basics of importing from Instagram to WordPress and hopefully you’re in a good position to take things to the next level. 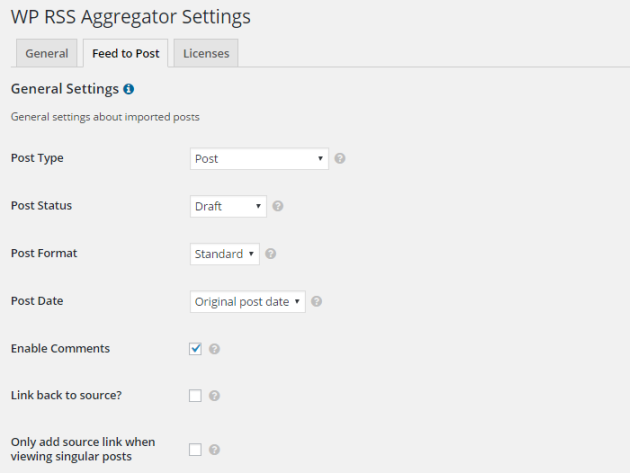 Have you used the WP RSS Aggregator plugin to import from Instagram to WordPress? Did you encounter any problems following this tutorial? We’d love to hear all about your experience so get in touch by commenting below! In what size does the images come from Instagram?